Steam locomotive 'Flying Scotsman' attracted a huge amount of attention when it's overhaul was completed and it began running on the main line again. There were serious problems with photographers trespassing for that perfect shot, and huge crowds on railway stations. To reduce the risks there were attempts to keep timings secret, and to an extent that has worked. All train movements are shown on the Realtime Trains website, and a special working from Southall (west London) to the railway museum in York caught my eye. Described as a diesel hauled empty coaching stock move, it immediately made me suspicious, since the museum doesn't house complete sets of coaches. 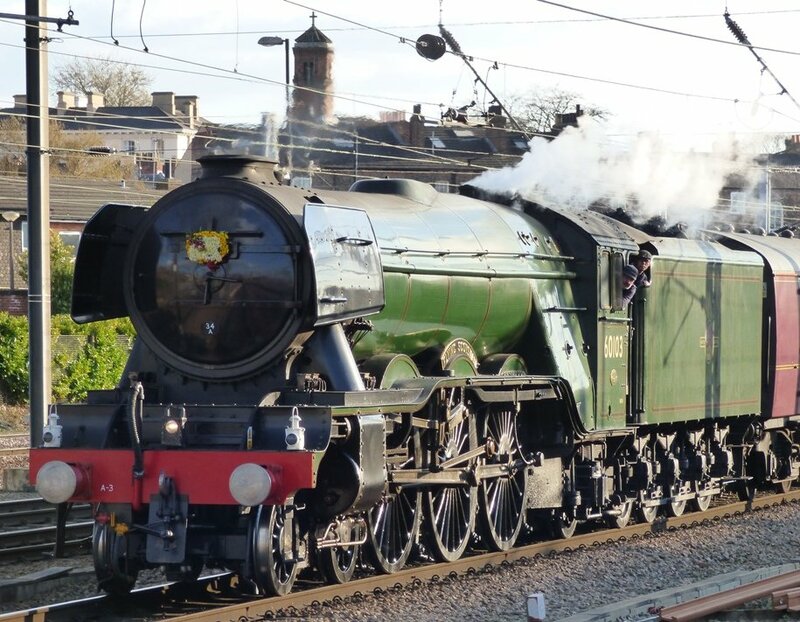 So, off to York railway station, and this shot shows what turned up - Flying Scotsman and it's support coach. Here it drifts slowly into the railway station before moving on to the museum site. There were only about a dozen photographers to greet it, though many passengers on the station were quick to record the surprise event. lovely shot. I love old tech and in particular railways - what a treat! I can smell the hot metal... Fav! Lovely shot of this beautiful big train. Fav. Have visit yesterday the museum steamtrain railroad near us. The locomotive was much smaller, 2C5 , and ours: an old U.S. army C.
It must be wonderful to see it running again. We went to a Steamfest at Maitland in NSW on Sunday and I will be posting photos from there over the next few days. Brilliant detective work, and a great shot. Lovely image of this iconic engine & very clever detective work. Beautiful shot. How nice to see it on the 'road' again. @shannejw @mahalo @carolmw @bizziebeeme @vignouse @seattlite @pyrrhula @onewing @peadar @jesika2 @sangwann Thank you all for your comments and favs, which put this shot on the Popular Page! Not long now before the regular steam services that run through York to Scarborough start, so more steam to come! @jesika2 You are quite right Jessika, the railway museum is well worth a visit, and I regularly do. By the way, I tell my grandchildren that I want to be a test pilot for Lego when I grow up! @onewing I didn't know you were a Yorkshire lass Babs - I too grew up in a mining area, and for my early years lived in Rawmarsh and Swinton, in South Yorkshire. @shannejw The summer service runs most Thursdays between 20th June and 5th September. It starts in Carnforth, sometimes coming to York via Skipton, sometimes via Hebden Bridge. I'm sorry to hear your daughter has allergy issues - I can sympathise since I have asthma and rhinitus. @peadar thank you Peter, I'll take a look. @fishers Hi Ian. Not too far from me, I was born in Mexborough. @stevepam Thank you Steve and Pam, it is good to see these machines in action, so there will be more to come!